Our final non-diapausing ♀ ​polyxenes asterius × ♂ zelicaon hybrid pupa eclosed into a crippled male. Fortunately, the important wing and body patterns are visible enough to compare to parent species, P. polyxenes asterius and P. zelicaon. The hybrid eclosed today, and weak and small as it is, it could not expand its wins fully just like the first one. However, this one managed to expand enough for us to clearly see the wing patterns, unlike the first who's wings were completely crumpled. Below are sided by side live comparisons between the hybrid and the parent species, P. polyxenes asterius and P. zelicaon; all individuals are males. Though intermediate between the parent species and many traits, the hybrid superficially resembles polyxenes more due to the black (rather than yellow) ground color. However, all the yellow regions on the hybrid are darker than in polyxenes more closely match the shade in zelicaon. Now let's get into the details, starting with the wings. The dorsal hindwings of the hybrid are similarly intermediate between the parent species as the forewings are. They are primarily black, but the band of yellow spots is larger than in polyxenes. Also, the marginal yellow spots are larger and more crescent shaped than in the polyxenes of our lineage, more like in zelicaon. The central hindwing is again more polyxenes like that zelicaon, simply due to the black ground color (though again, slightly brownish rather than pitch black). However, the other traits seem more intermediate, with the band of spots in the middle being orange-yellow, rather than orange in polyxenes or yellow in zelicaon. The marginal yellow spots are longer lengthwise and more rectangular, similar to zelicaon, and not rounded or tear drop like in polyxenes. The ventral hindwing of the hybrid is perhaps the most interesting of the wings. It is again black in ground color rather than yellow. However, intermediate of the parents, it contains much more blue past the band of orange spots than in polyxenes, and less than in zelicaon. Also, the band of orange spots is lighter and more yellow than in polyxenes, and is more simplistic, lacking the orange spot on the discal cell like in zelicaon. Like mentioned in the previous post with the first hybrid, the yellow stripes on the head and thorax of the hybrid are short and small like in polyxenes, unlike the long, connected stripes in zelicaon. However, like other yellow regions of the hybrid's body, the yellow is darker than in polyxenes, and more like the shade in zelicaon. The hybrid abdomen is very interestingly intermediate between the parents which we briefly described it in the previous post already. On the hybrid, the abdomen very clearly has two rows of rectangular yellow spots laterally. This is intermediate between polyxenes and zelicaon, because in polyxenes, the abdomen has three rows of rounded yellow spots - two lateral and one dorsal, and in zelicaon there are two solid yellow stripes rather than rows of spots. The placement of the top row of yellow spots in the hybrid is also intermediate between the location of the dorsal and top lateral row in polyxenes, and right in the middle of where the larger solid yellow stripe in zelicaon is. Our male ♀ Papilio ​polyxenes asterius × ♂ Papilio zelicaon hybrid finally eclosed, but unfortunately did not expand its wings. We are extremely disappointed to say that our ♀ Papilio ​polyxenes asterius × ♂ Papilio zelicaon hybrid male eclosed today but could not expand its wings fully. We don't know why it became crippled or if hybridization could have caused it, though usually the males of machaon group hybrids should have no problem eclosing. Despite the crumpled wings, it is still possible to see the body and the general pattern on the wings. We tried to get shots from many different aspects, shown below. From what we can see, the hybrid appears to resemble polyxenes more so than zelicaon. Both fore and hind wings have a considerable amount of yellow, but it is hard to say exactly how much since they are not fully expanded. The males of the parent species both have yellow on their wings, with zelicaon having more. The hybrid definitely seems to have less yellow than a zelicaon would have and looks more like polyxenes. However, perhaps if the wings were expanded, there would actually be a lot more yellow than it looks, and perhaps some of the grayish looking parts could expand to a yellow-gray, intermediate of the parent species. We do not know. As for the ventral aspect the wings, they again seem to resemble polyxenes more, with the forewing having only small amounts of yellow and the hindwing having orange spots. However, probably the orange spots on the hind wing will expand into a pale yellow orange based on how light they are even when not expanded, which would be intermediate of the parent species, since polyxenes' spots are well-defined and dark, while zelicaon only have traces of orange. Looking at the body - mainly the abdomen, the hybrid again resembles polyxenes slightly more. In the parent species, polyxenes has several rows of yellow spots down the length of its abdomen while in zelicaon, it is a single solid yellow stripe on each side with a poorly defined solid stripe on the ventral side. The hybrid very clearly has rows of spots rather than solid yellow, but the spots appear to be slightly larger and more rectangular and "dash" like than than in polyxenes. The head and thorax region looks more polyxenes as well. In polyxenes, there are broken pale yellow spots on the thorax while in zelicaon it is two solid dark yellow stripes. The hybrid has spots rather than solid stripes, but they appear slightly thicker and darker than normally would be in polyxenes. Comparison of the pharate pupae of the black swallowtail (Papilio polyxenes asterius), anise swallowtail (Papilio zelicaon) and a ♀ Papilio ​polyxenes asterius × ♂ Papilio zelicaon hybrid cross. The hybrid is almost here now. Just another day and it should be out. As of tonight it is pharate and the wing patterns can already be seen. We currently also have pharate zelicaon and a close to pharate polyxenes (the two parent species) for comparison, plus an actually pharate male and female polyxenes photo from a month ago (bottom center). All pupa shown are male except for the female polyxenes. The main thing to compare here is the amount of yellow on the wings. 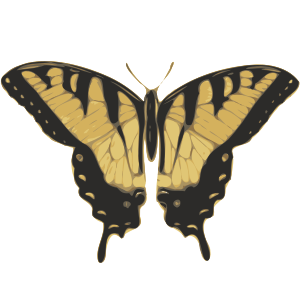 It's the number one difference that separates zelicaon and polyxenes adults (and many other closely related western and eastern swallowtails) and thus the also main area of focus on the hybrid wing patterns as well. In zelicaon, the fore and hind wings of both males and females are predominantly yellow. In polyxenes, both males and females are predominantly black, but the male has a thin row of yellow on both fore and hind wings while the female is almost entirely black. See Papilio zelicaon and Papilio polyxenes asterius Side by Side Pictures for a visual. On the developing pupae, the zelicaon very clearly has a large yellow portion on the hindwing while the male polyxenes only has a small strip of yellow spots. The hybrid, on the other hand appears to be a perfect intermediate, having the yellow portion of the zelicaon wing pattern but rather than a bright rich yellow, it is partially masked by black, turning it into a greyish yellow. The hybrid also has the marginal row of yellow spots, a trait shared by both parent species. Here we compare the pupae of the black swallowtail (Papilio polyxenes asterius), anise swallowtail (Papilio zelicaon) and a ♀ Papilio ​polyxenes asterius × ♂ Papilio zelicaon hybrid cross. Well, now that all three have pupated, we are going to make some meager attempts to put them side by side and compare them. Meager because both the Papilio polyxenes asterius and hybrid pupa in the photo are slightly deformed and we only have male hybrids of the green form (all of the females are light tan diapausing forms) whereas the P. polyxenes asterius is female, making this not exactly a perfect one on one comparison. The most obvious differences we can make out from this are in shape and color. As we have noted in previous posts, the P. zelicaon are fatter than the P. polyxenes and are a yellow green rather than bluish white (these things are also true of the larvae). The hybrid seems, unsurprisingly, to be intermediate between these two spectrums, although it is hard to say for sure because the three are not the same size based on weight. While our sample sizes are pathetically small and unable to statistically reject to any conclusions, it is interesting to note that, assuming the P. polyxenes asterius and the hybrids are smaller (to a similar extent) than P. zelicaon. This may be because the hybrids came out of P. polyxenes asterius eggs, which are a lot smaller than those of P. zelicaon. Shockingly, one of the larva has already purged today and is only 1.0 g; the others are still hovering at around 1.5 g and also look somewhat close to full grown; perhaps the incubation effected them negatively (because their parents were about P. zelicaon size)? Here we compare the fifth instar larvae of the black swallowtail (Papilio polyxenes asterius), anise swallowtail (Papilio zelicaon) and a ♀ Papilio ​polyxenes asterius × ♂ Papilio zelicaon hybrid cross. This will probably the last post with all three types of larvae together, seeing as they are almost done growing and it's getting a bit redundant. As the larvae grew larger, the differences started to become a little less obvious, especially between the hybrid and Papilio zelicaon. The hybrid does still has slightly smaller and rounder color spots, though. The pure P. polyxenes asterius still maintains a very distinctive look with the very small and circular color spots, even though they do actually break the black bands a bit now. In terms of shape, the hybrid larvae is noticeably shorter and thicker, as if it inherited the bulky body of P. zelicaon and the fat thorax of P. polyxenes asterius. The hybrid larvae are also moderately variable in color form (strip thickness, color of the spots, shade of green, etc.) , unlike the P. polyxenes which pretty much all look identical. Both the P. zelicaon and the hybrid larvae are fond of flowers (seemingly prefer them over the leaves) and are comfortable sitting in the open sun. The P. polyxenes asterius only occasionally nibble at the flowers and appear to be indifferent towards them. The P. polyxenes asterius is also the only one that consistently regurgitates when violently handled. Interestingly, the hybrids seem to use their horns more frequently than either species. Here we compare the fifth instar larvae of the black swallowtail (Papilio polyxenes asterius) and anise swallowtail (Papilio zelicaon). Although the P. zelicaon​ larva in these photos is a nice light form, even the darker forms have the same distinct differences including the huge color spots and bulkier shape. The P. zelicaon are much more cryptic on the flowers than the P. polyxenes asterius in these photos and the P. zelicaon seem much more comfortable on it in terms of their behavior. However, after offering the P. polyxenes asterius some flowers, they eventually did also eat them. Here we compare the fourth and fifth instar larvae of the black swallowtail (Papilio polyxenes asterius), anise swallowtail (Papilio zelicaon) and a ♀ Papilio ​polyxenes asterius × ♂ Papilio zelicaon hybrid cross. The hybrid larvae are still behind, so there quite aren't any fifth instars yet. However, we still took some more photographs of the fourth instar compared to the two pure crosses. ​The hybrids are truly perfect intermediates, no matter if they are dark or light forms. They share the same bulgy, shiny appearance as Papilio zelicaon, but aren't quite as spiky. The light forms seem to be patterned similar P. polyxenes asterius in the amount of white they have but still have thicker black bands than the pure breed and have broken saddles. Both the dark and light forms have smaller spots than Papilio zelicaon like P. polyxenes asterius. A good way to look at it overall is that the P. zelicaon are messy, the P. polyxenes asterius are smooth and clean, and the hybrid are just in between. There are lots of fifth instar P. polyxenes asterius now, and they look distinctly different than P. zelicaon fifth instars. The P. polyxenes asterius still have much smaller and more circular spots such that they don't break the black bands and the spots on the thick thoracic band of P. zelicaon are still mostly absent. Because of this, they actually look blacker than P. zelicaon despite all being much lighter in the fourth instar. The greenish white bands seems to be to be much more even, at least for now, without any blue bands mixed in between that are common in P. zelicaon. The shape of the P. polyxenes asterius resembles tigers much more than P. zelicaon​ because they are so long and skinny with very large thoraxes; P. zelicaon tend to be slightly more bulgy between segments. Overall, the P. zelicaon are much more cryptic on flowers than the P. polyxenes asterius may seriously reflect on the different climates that they come from and what they feed on. In fact, we have put in some flower for the P. polyxenes asterius to see if they will feed on it and so far they have not. As for size, it now seems that the P. polyxenes asterius might actually have a chance to get bigger. They certainly look larger in the photos, but it is unknown just how much they have fed already. In the fourth instar, the P. polyxenes asterius seemed just slightly smaller with most at o.3 whereas 0.4 dominates P. zelicaon based on previous rearings. Very surprisingly, we now have a single 0.5 g P. polyxenes asterius which is the rare maximum for P. zelicaon, so there is clearly a lot of variation. But no matter what they are in the fourth instar, the fifth instar is the bulk of the growing so anything could happen. . .